While Peterborough is not the city that time forgot, it is in danger of turning into the city that forgot the time - with a number of public clocks either broken or telling the wrong time. While most people now have a smartphone or watch to tell them the time, four clocks in the city are either fast or slow - in some cases by a number of hours. With the clocks going back an hour this weekend, as Britain switches from British Summer Time (BST) to Greenwich Mean Time (GMT) there is the potential to put the timepieces right. 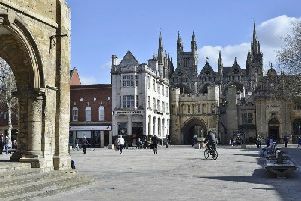 One clock that will definitely be right on Sunday will be the sundial on the Guildhall in Cathedral Square - which is set to GMT. Other ‘wrong’ clocks include the one on the tower above Asda in Rivergate, the clock above McDonalds in Cathedral Square, one on the corner of Long Causeway, Broadway and Westgate, and one on an advertising hoarding near the Henry Royce Pub on Broadway. A Peterborough City Council spokesman said they were asking JC Decaux, who operate the advertising hoarding clock, to set that to the right time. The spokesman said other clocks they manage would be put right. Asda did not make a comment about their clock being four hours fast. The clocks officially go back an hour at 2am on the last Sunday in October, which this year is this Sunday, October 28. They go forward by an hour at 1am on the last Sunday in March - which in 2019 is March 31.